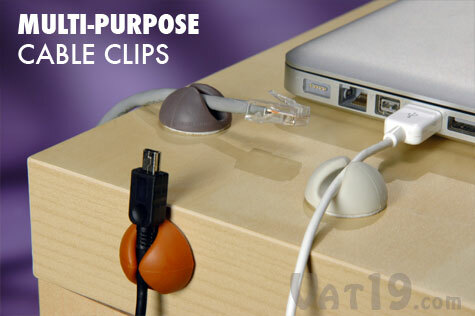 With CableDrop Computer Cable Organizers, you can quickly de-clutter that rat's nest of cables under your desk. The tough, yet flexible CableDrop gently grasps cables of varying sizes and keeps them handy (and off the floor) after you unplug them. Stick the CableDrop anywhere you want to hold a cable, yet still be able to unplug it or extend it easily. Each order includes six CableDrops (two each of white, brown, and gray). CableDrop Computer Cable Organizers gently hold your cables so they can be unplugged without falling to the floor. Stick a CableDrop on the back of the table where you charge your laptop and your power cord will always be at-the-ready. In fact, place a CableDrop anywhere you'd like a cable to be held but easily unplugged or extended. Keep your cables organized with the CableDrop Computer Cable Organizer. Each CableDrop Cable Organizer features a strong adhesive backing that will stick to most any surface. In fact, it's strong enough to place the small CableDrop upside down on the underside of a table for super-stealthy cable organizing. The strong adhesive of the CableDrop allows you to stick it anywhere, even upside down. The CableDrop Cable Organizer is made from a tough but pliant plastic. 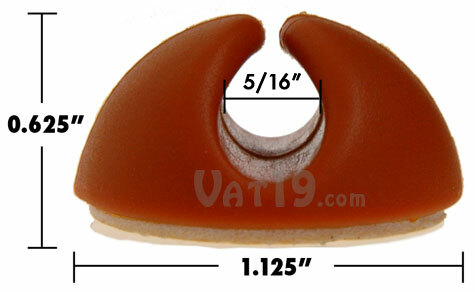 Its footprint is barely over an inch in diameter, yet it can flex to accommodate bulky ethernet cables, coaxial cables (used for TVs), or standard power cables up to 5/16" in diameter. The CableDrop can also handle thinner wires such as those found on earphones. The opening between the CableDrop's "arms" is purposefully narrow to prevent those skinny wires from wriggling loose. Despite its small size, the tough yet pliable plastic of the CableDrop is capable of grasping cables of varying sizes. 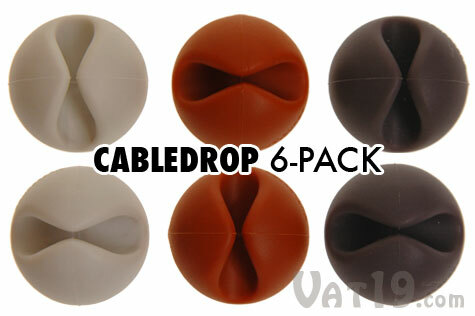 Each set of CableDrop Cable Organizers includes 6 CableDrops. You'll receive two of each color pictured below (white, brown, and gray). Each set of CableDrop Cable Organizers includes six cable clips in the colors pictured above. Question: Will the adhesive on the CableDrop destroy the rich mahogany finish on my wise-smelling furniture? Answer: Possibly. Like any other double-stick-style tape, the CableDrop's adhesive could cause marking on your furniture's finish. However, you can use an adhesive solvent to remove any residue left behind after removing the CableDrop. We also suggest placing the CableDrop on an inconspicuous area of your furniture. Question: Can I stick CableDrops on the wall? Answer: Yes. Place a CableDrop anywhere you wish to have cables held, yet capable of being quickly unplugged or extended. The strong adhesive on the bottom of the unit holds CableDrops upside down and vertical. Question: Can I get a 6-pack of all white CableDrops? Answer: Yes, just order three 6-packs of CableDrops and throw away the other two colors. If you can't tell that we're joking, by all means, the Add to Cart button is just a few pixels to the south.